Brief Synopsis: The Justice League International fights Maxwell Lord for Blue Beetle. Issue Notes: Tie-in to Brightest Day. The title of this story is an allusion to the Wizard of Oz. FIRST APPEARANCE: First appearance of "Arthur Lord," father of Maxwell Lord IV. The roman numerals in Max's name don't necessarily mean that his father was named "Maxwell Lord III," merely that Max is the third man in his family to share the name. A reporter in Justice League America #53, however, indicates that Max's father was indeed a Yale University professor of English named "Maxwell Lord III." Were that so, it is possible that the "Arthur" of this issue is the same man going by a middle name or nickname. So little is known about Maxwell Lord's family history that the Arthur Lord employed by ChemTech in this issue and the Maxwell Lord III of Yale in Justice League America #53 need not necessarily be different characters. Oddly, Booster met a woman named "Naomi Lord" in Booster Gold Volume 2, #38 -- just a few months prior to this issue -- who was implied to be Maxwell Lord's mother. Was Booster mistaken, or are "Naomi Lord" and "Rebecca Lord" the same person? And is it merely a coincidence that "Rebecca Lord" is also the stage name of a well-known pornographic actress? Booster Gold, Captain Atom, Fire, Ice, Rocket Red, and Skeets have arrived in time to see Maxwell Lord standing over the apparent corpse of Blue Beetle, lying supine with a graphic gunshot wound in the center of his forehead. FASHION ALERT: Booster Gold has a large blue star on the back of his uniform. Though it is not part of his regular uniform, we've seen this star before; the disappearing-reappearing star first appeared in Justice League America #34, and has come and gone in the years since. Sometime in the past, Max Lord and his mother discuss his failed takeover of ChemTech. ChemTech was the corporation that Booster Gold refused to endorse in Booster Gold, Volume 1, #1 because he knew that they would "be bankrupt within a year." Did the company go bankrupt before or after it was acquired by LexCorp? Booster appears in a flashback to the early membership of the Justice League International. Also pictured are Batman, Black Canary, Blue Beetle II, Captain Atom, Guy Gardner, Martian Manhunter, and Mister Miracle. Notable by his absence is Rocket Red, the Soviet Union's forced inclusion in Maxwell Lord's United Nations-chartered Justice League (as seen in Justice League International #7). After the JLI is ejected from the Checkmate vessel over the Sea of Japan, the Checkmate ship teleports away with the sound effect "HWEEEEEEE*". I have no idea what sound an asterisk makes. 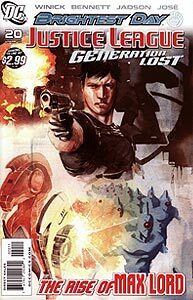 Boosterrific Review: Despite several anacrhonisms and apparently conflicting continuity, this issue is a must read addressing for the first time Maxwell Lord's past and motivation without damaging to the series' quickening pace. Well done. Max Lord has entered the pantheon of DC villains and this issue helps flesh him out. I like this issue because Max Lord needed a more coherent history and what is presented here is a significant improvement. I don't understand why continuity was changed when it seems unnecessary (just use the establish names for his parents... sheesh) but it doesn't really bug me too much.